5. What are your favourite tools? This made me laugh! It’s like asking who is my favourite friend! I love them all for the different things they have to offer. One of the splendid things about being a handspinner is the sense of community there is in the huge network of craftspeople around wool-working, who all support each other. Because of my work over the years for Woolfest, which is organised by the Wool Clip co-operative to which I belong, I have had the honour to meet some of the most talented craftspeople in the country and many have become friends. This makes it a special delight to use the tools which they make. This one is made of maple and is very lightweight. It was a present from my friend Lea who comes over from the US every year to help us at Woolfest and was made by friends of hers from a maple tree on their farm. My other really useful spindling tool is the elm-wood bodkin which I hang on a thread around my neck when I go out. It’s by my Wool Clip colleague, Jean Wildish and is simply a beautifully-made pointy stick and is perfect for quickly untangling any yarn which has knotted, by jabbing the point into the middle of the knot and wiggling. It’s resting on a spinning cloth, a gift from my friend June Hall. This is such a great idea: a cloth which is dark on one side and light on the other and sits on my lap, so that I can see what’s going on when I’m spinning in dark places (and it stops bits of fibre getting everywhere too!). 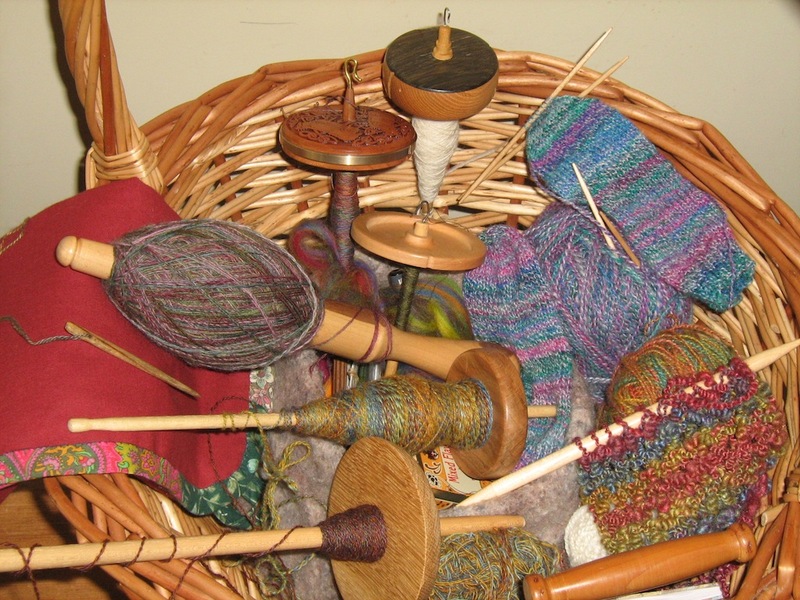 I usually have some knitting needles with me in case I want to make samples and always a sock in progress, since I also teach sock knitting and write patterns for the mill-spun yarn I produce with my colleague Jan Hicks, who dyes it in the most gorgeous colours. Jan’s amazing dyeing is incredibly important to my work, but it is mostly her mohair which I use in my handspinning (she keeps a prize-winning flock of angora goats and gave me little goat Katia, (my first angora), which is of course 100% Goat and not 100% Wool, so I haven’t shown her here! She also dyes fleece and combed tops, however, and I need all my powers of resistance (again!) not to empty the shop of it, since we do need to have something there for our customers! And the basket! A wool-worker can never have too many baskets, or the wool gets out of hand and we end up wading through it. This one was made by Martin Buckle, who has been a dear friend for most of my life – as children, we used to look forward to his visits so much, because he entertained us with the amazing things he made and he taught us so much. It isn’t seen to its best advantage in the picture, but it is truly the Queen of All Baskets, perfect for slinging over the arm with everything needed for a woolly day out! 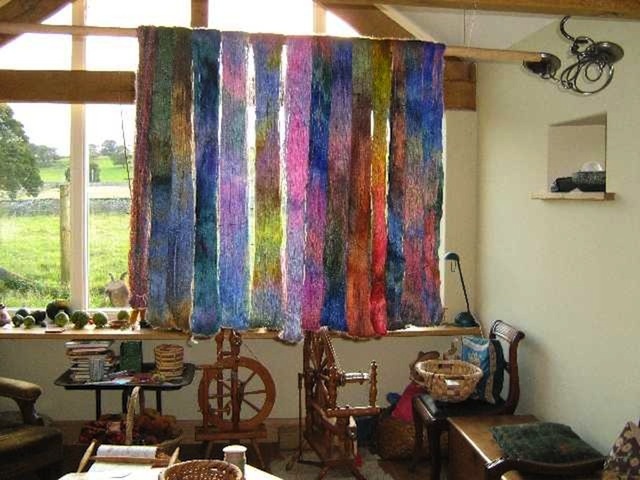 This wheel belonged to my friend and Wool Clip colleague, Caroline Rawlinson, who had a very successful spinning and dyeing business and originally came up with the idea for Woolfest. I met her ten years ago and, with my friend June, she taught me to spin. 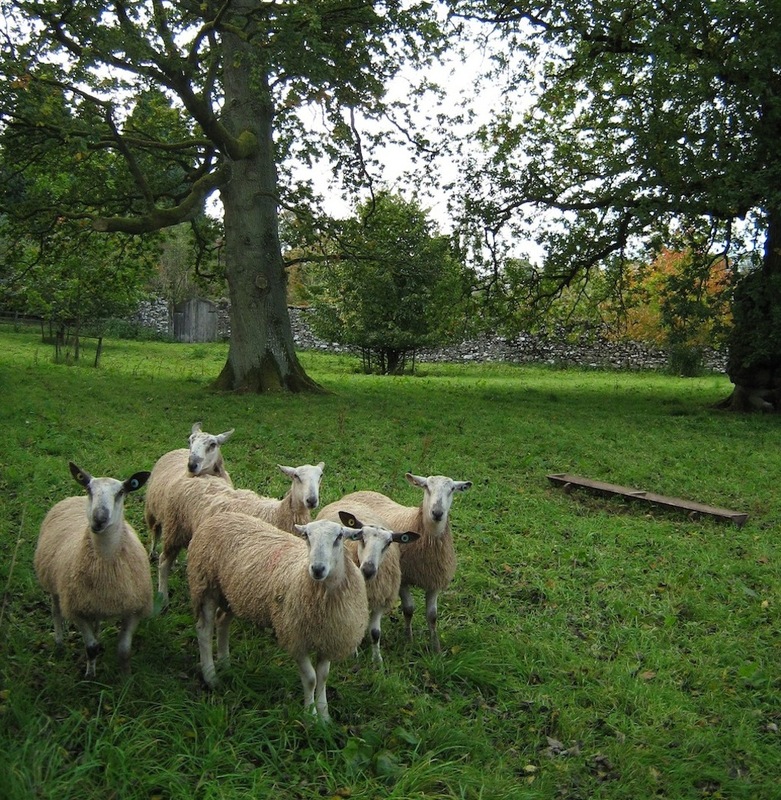 It was with their enthusiastic encouragement that I joined the Wool Clip. Carolyn died in 2007. I still miss her very much and think about her most days and especially when I’m using her wheel. One day I hope I’ll be able to make yarn as beautiful as hers. 6. If money/time were absolutely no object, what would be your ultimate handspinning project? I always have so many ideas going on for projects that it’s hard to choose the best one, but I do love making blankets! I would love to make a huge blanket. With fleece from the sheep in the village. Coloured with dyes from local plants I forage. 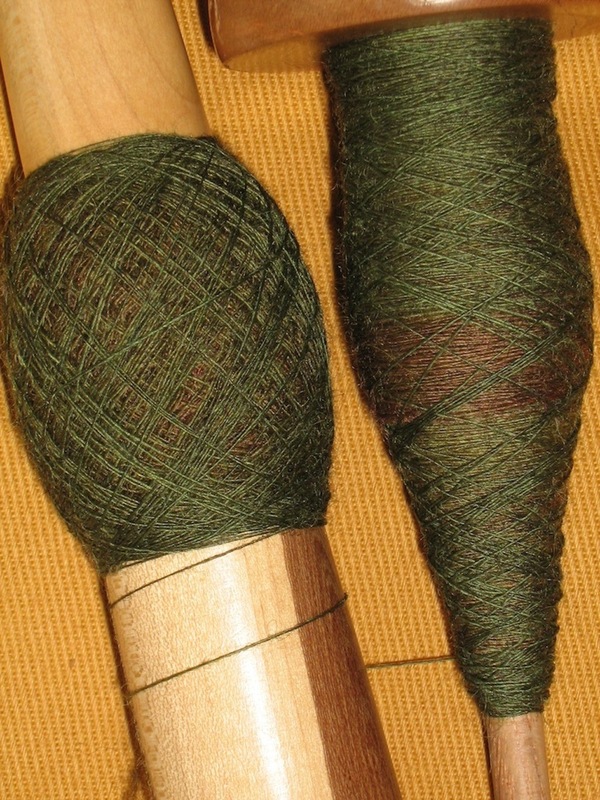 Spun on the spindle – very finely, but plied lots to make a thick yarn. 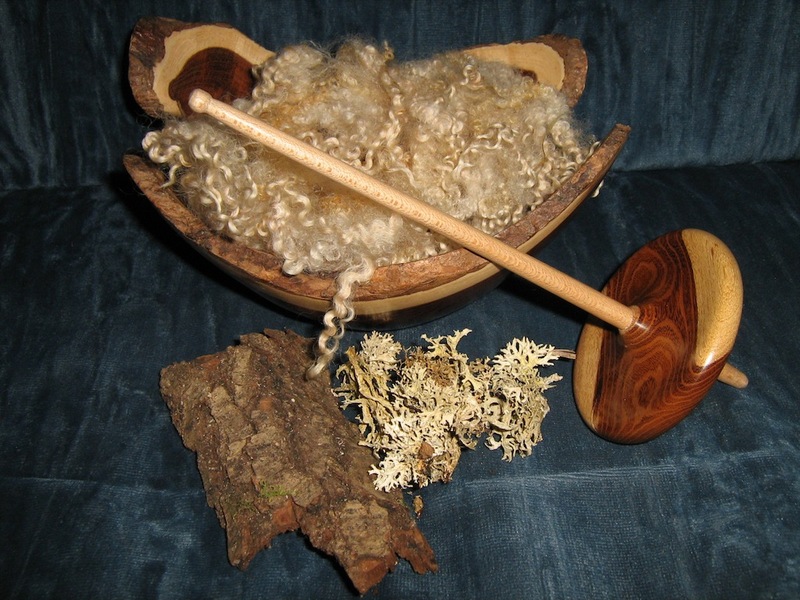 Here is some of their fleece, in a beautiful bowl of laburnum wood from an old tree which used to live in the corner of the paddock (well fenced off, because laburnum is poisonous) and which local wood-turner Alan Wedgwood made into bowls when it finally came down. With some bark from a fallen branch of one of the oaks, which will give a rich brown dye, and some lichen for yellow dye, gathered from the ground after a storm (never from the tree – it takes many years to grow). There are other plants for different colours in the hedge beside the paddock. And a tempting empty spindle, made from laburnum by John Lackie….. This may take some time…..